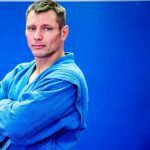 Vlad is a “Master of Sport” in SAMBO, the founder of SAMBO Fusion, a brown belt in Brazilian Jiu Jitsu, a 1st degree black belt in karate and a 2nd degree black belt in Judo. Since immigrating to the U.S., Vlad has placed three times in the USA Open, as well as representing team USA in combat SAMBO in the 2008 World Championship. Vlad continues to teach at Soul Fighters Brewster in New York, as well as the Evolution Grappling Academy and Axios Fitness Kickboxing.